Clara Lemlich works in the garment district of New York City at the turn of the twentieth century, with other teenage girls from the old country—various “old” countries. Clara and her family came from a Russian shtetl—Jewish village—where girls were not allowed an education. Against her father’s orders Clara barters for books—Tolstoy and herbals. She helps cure people of their illnesses. She would like to be a doctor one day. Her father does not want her speaking—and definitely not reading the oppressor’s language—Russian. When he finds her books, he burns them. It’s too late. She has already learned Russian. 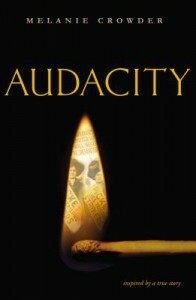 So begins “Audacity” (Philomel 2015) by Melanie Crowder, a beautifully written novel in verse based on the story of union organizer Clara Lemlich. When the pogram comes, the five Lemlich children are sent fleeing into the woods. Crowder writes, “Tonight/ we will sleep/ in the woods/ with the night crawlers/ and the wolves/ and the soft-throated owls.” Jewish people are murdered, their houses burned. The Lemlich family saves their kopecks and flees, starting the long journey to America, in 1904. After jostling in carts and trains they’re sequestered in an English poorhouse, then travel steerage to New York City. Clara’s little brother is detained at Ellis Island with a fever. Weeks of anxiety ensue before the family is reunited. Clara’s orthodox father and her brothers spend their days praying while the women work. Her mother sews piecework at home, scrubs floors, and cooks cabbage. Clara works in a sweatshop to support the family. And goes to English classes at night. Clara speaks out against being locked into the workroom, not being allowed to use the lavatory, speaks out against the filth, fifteen hour days, seven day each week. She’s fired. She finds a new job at another sweatshop, worse than the first. At school she is singled out as the one immigrant who might earn a scholarship to go to college. She works fifteen-hour days, then attends night school. A fellow worker sickens but is not allowed a trip to the lavatory. Clara speaks up and is fired again. She finds the union house and listens. As her English improves she goes into the streets, stands on a soap box and asks well-to-do women if they know where there shirtwaists—their tailored blouses—come from? Clara gets another job and starts organizing. Strikebreakers or “gorillas” beat her up repeatedly. She is fired again. Men workers want to strike, but will not include the women workers. Clara fights for women’s rights within the union. Workers begin striking—but too few. Shop owners call the striking women whores. Newspapers report it. Husbands and fathers forbid their wives and daughters from striking. Clara speaks at a union meeting and calls for a general strike. Thousands walk out of work. Finally some changes are made. As a reader your blood will boil against the injustice. You’ll cheer for the courage of this small bold reformer. The review made me cry, not sure I could handle the book right now. Illinois, in U.S., in the world. Go Bernie.